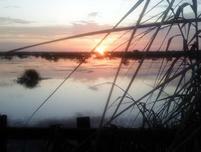 Come with us and explore the waters of the open coastline, lakes and bayous of Southeast Louisiana. 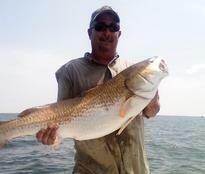 You may fish the coastal bays, reefs, rigs and barrier islands or the inland lakes, bayous and the surrounding waters. We target trophy speckled trout during the spring and summer spawning season as well as other species such as redfish, flounder, black drum, croaker, sheepshead, and even bass at certain times of the year. As our guest, you and your party will fish aboard a 25 foot custom built well equipped boat with a porta-potty and a Captain that is knowledgeable, professional and friendly. All fishing charters include fuel, bait, tackle, ice, rods & reels and fish cleaning. We will do everything possible to make sure your trip is enjoyable for you and your party. Over 200 years ago settlers from the Canary Islands, "Islenos" settled this land for its tremendous bounty. Today, it is still a mecca for those who love the outdoors. Located within an hours drive of New Orleans, Delacroix is a world-class fishing destination. We fish the open waters of Breton Sound and its surrounding waters as well as deep inland marshes. 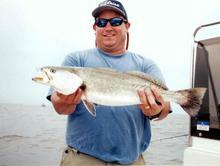 We target speckled trout, redfish and other game fish that are abundant in the area. We use light tackle and live, natural and artificial baits. We offer six to eight hour trips for up to six anglers and multiple boats are available for larger groups. Lake Pontchartrain is known for producing trophy speckled trout. In fact, three of the state's top ten record-book trout were caught in the lake including the second largest weighing in at 11.99 pounds. We target trophy specks and numerious other species that are found near the lake's bridges, reefs, shorelines and surrounding waters. We use light tackle and live, natural and artificial baits to give our guests the best chance of catching the big ones! We offer four and six hour charters for up to six anglers per boat and multiple boat trips are available. Less than one hour from New Orleans!